Booster sets with the latest generation of VFD in each pump to get full control of all electrical and hydraulic parameters. Functioning with change over function. Supports up to 25 Bar pressure transducers and can be installed on the pump fan cover or wall mounted. Using variable frequency drives series ISKUT AC, many advantages can be obtained such as energy saving, long life motor and mechanical components of the pumps. 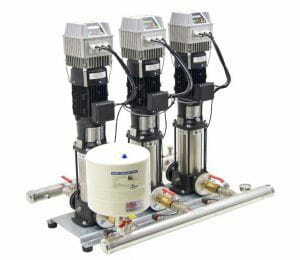 The software can control up to 8 pumps. The main uses are water supply at constant pressure in appartments, commercial buildings, hospitals, irrigation, housing development, greenhouses, industrial installations, etc.